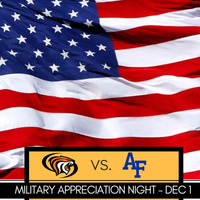 Be sure to come out and support your Men's Pacific Basketball Team as they go against Air Force! This is also Military Appreciation Night | Camouflage Bracelet Giveaway for first 450 fans. With the partnership with Travis Air Force Base and numerous retired/active Military members, this event will be special.